The metro in the Helsinki metropolitan area will be extended to the west in two phases. In the first phase, there will be eight new stations, and five more will be included in the second phase. The metro will operate on a rail line of 21 kilometres underground in two parallel tunnels. The first phase was completed in November 2017 when the Ruoholahti-Matinkylä phase was opened for traffic. The west metro will include thirteen new stations. The stations along the 14-kilometre Ruoholahti–Matinkylä section will be located in Lauttasaari and Koivusaari in Helsinki, and in Keilaniemi, Aalto-University, Tapiola, Urheilupuisto, Niittykumpu and Matinkylä in Espoo. The seven-kilometre Matinkylä–Kivenlahti section of the rail line will be completed in the second phase, and it will include five new stations: Finnoo, Kaitaa, Soukka, Espoonlahti and Kivenlahti. An underground metro depot will be constructed in Sammalvuori. In addition to the stations, a total of 23 shafts will be built for pressure equalisation, ventilation and smoke extraction. The shafts will also be used as emergency exits. 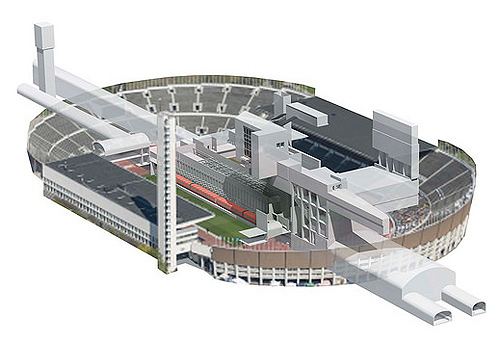 Size of Tapiola station compared to Helsinki Olympic Stadium. Picture made by APRT Arkkitehtityöhuone Artto Palo Rossi Tikka Oy.